Oh, well, what difference does it make who did [whatever accomplishments], so long as they were done. What are you going to do when you get the vote? In 2011 America’s population was 51% female while women made up 17% of the Senate and 16.6% of the House of Representative.3 Our foremothers would have been disappointed at the slow progress towards equal representation in our nation’s leadership. That road in Arizona began with the passage of a suffrage initiative referendum on 5 November 1912 when Arizona joined eight other western states–Wyoming, Colorado, Idaho, Utah, Washington, California, Oregon, Kansas– upon the road towards equal representation. Another eight years would pass until passage of the 19th Suffrage Amendment to the United States Constitution on 26 August 1920. British females would not earn that right until 1928. “According to the White House Project, nearly 90% of Americans are comfortable with women as top leaders in all fields—from academia and business to media and the military”.3 On 9 Feb 1883 The Arizona Weekly Democrat cited, “The women of the territory don’t want to wear the breeches. Leave the ladies to their tea parties and home work.”4 Think of all the women across the nation who have helped shatter the traditional view of woman’s role over the past 100 years! The wheels of change move slowly and require constant effort in our society. This web page is created to honor our foremothers who were brave enough to register and then exercise their political franchise in our democracy. Many were leaders and change agents in Tucson while others were average women struggling to survive and raise families within their communities. They realized the power of the ballot to bring about change. These women claimed their place in history, but left little evidence about their individual experiences written in their own words. If a woman did not preserve a journal, diary or personal letters, one cannot know her thoughts. They were often only preserved in records by their spouse’s name or the accomplishments of their father. On 15 March 1913 Arizonan women were finally allowed to register to vote after almost a 50 year struggle to gain the right to become equal citizens in the political realm. Many women and men– Anglo, Hispanic and Black– helped achieve this accomplishment. The suffrage movement had been an ongoing struggle from the time Arizona was granted territorial status in 1863, but woman suffrage was never made part of the 14 February 1912 state constitution until 5 November 1912. This site contains the 23 January 2012 transcription of the Great Register 85.3.65 Pima County Recorder’s Office, RG11SG5, History and Archives Division, Arizona State Library, Archives and Public Records. The register contains each woman’s signature, address, occupation, height and weight (In the EXCELFILE 11 point font is used for what was written in the register; 8 point font is used for added background information). Two columns are missing on this data base because all registrants could read English and took the oath. When a registrant is listed as UNKNOWN, it should be considered as a male until someone revisits the microfilm to confirm. The original register is unavailable to the public. This historic document helps recover HER-story and leads to other sources of information. Such a data base also allows historians to sort the data to create a picture of Pima County women, both by their presence and by their omission. The almost 600 women represented about one-sixth of the Pima County women eligible. More research is needed to learn the names of the women who registered when the Great Register next opened in 1914 from 1 May to 15 October to participate in the state and national elections. Another search needs to be done to discover the Pima County women who registered earlier so they could vote in school elections and some municipal elections. See the suggested reading and research links to discover the larger story, as well as the stories of individuals. One might plot addresses, continue to “flesh out” specific women and their families, analyze census records, or transcribe the 1914 registration to see the impact of women in the first national election where they could voice the opinion at the ballot box. Who were the female leaders in Pima County? What organizations led the way? Research in manuscript collections, city directories and the biographical clipping notebooks at the Arizona Historical Society Library led to answers to these questions. However, much more analysis is needed and should be shared to recognize these unsung heroines. It is hoped others will use this data base as a beginning to seek out more of the stories. 1. From original1936 Interview with Clara Fish Roberts by her daughter Virginia Roberts Flaccus cited in “A History of the Edward Nye Fish House and Edward Nye Family.” Bettina O’Neil Lyons. Tucson Museum of Art (1980), p. 19. 2. Sharlot Hall Museum, Prescott, AZ. 3. White House Project in “Women and Leadership”, American Association of University Women, 2012. 4. “Votes for Women! Arizona Territory’s ill-fated Suffrage Bill of 1883.”Sharlot Hall Museum, Prescott, AZ. 5. “Tucson Women Deserve Praise”, The Arizona Daily Star, 2 May 1913. Cleere, Jan. Levis & Lace: Arizona Women Who Made History. Rio Nuevo (2011). Conners, Jo. Who’s Who in Arizona. Vol. I. The Arizona Daily Star Press, Tucson, AZ (1913). Ebook with pictures or just text. “Enabling Acts” Arizona Legislature. (14 February 1912). Garcia, Kathleen M. “American View of Mexican Women, 1820-1890.” Arizona History Convention Paper, 1998. “Happy Century, Arizona. But Why Is the State Still Forced to Prove its Americanness?” Zocalo Public Square. (14 Feb 2012). McClintock, James. Arizona, prehistoric, aboriginal, pioneer, modern: the nation’s youngest commonwealth within a land of ancient culture. S. J. Clarke publishing (1916 ). Ebooks: Vol. 2 Chapters XLVIII and CLVIX; Vol. 3 Biographies. Osselaer, Heidi. “From Sidelines to Center Stage: Women and Arizona’s Quest for Statehood.” Territorial Times (November 2011). ————- Winning Their Place: Arizona Women in Politics, 1883-1950. University of Arizona Press (2011). Rembaugh, Bertha, comp. In the United States: A Digest of the Laws Concerning Women in the Various States and Territories. G. P. Putnam’s Sons, 1911. Sheridan, Thomas E. Los Tucsonenses: The Mexican Community in Tucson, 1854-1941. University of Arizona Press (1992). Sonnichsen, C. L. Tucson: The Life and Times of an American City. University of Oklahoma (1987). Stanton, Elizabeth Cady, et. al. The History of Woman Suffrage, 1883-1900. Ch. XXVI Arizona. Fowler & Wells, 1902. Ancestry. com. Searchable resource that includes many resources on-line such as Tucson city directories and newspapers. 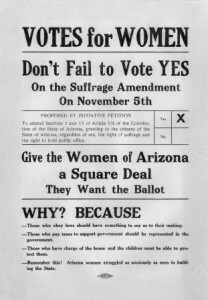 “One man’s thoughts on women’s suffrage.” ADS Sept. 7, 1912 Arizona Daily Star | Posted: Friday, September 9, 2011. “Star echoed call for women’s right to vote.” Posted: Thursday, March 31, 2011 12:00 from Prescott Journal-Miner, originally appeared in the Star on June 4, 1912. “Women’s rights, cows, bankers were 1912 editorial topics” Posted: Wednesday, October 5, 2011 12:00 A collection of editorials that originally appeared in the Star in October 1912. “The Convention.” Arizona Daily Citizen, 19 September 1891. Arizona Genealogy Birth and Death Certificates. Arizona Department of Health Services (2012). Arizona Historical Society Museum, Library and Archives, Tucson, AZ. The library has Tucson city directories and biographical clipping notebooks which were useful in uncovering information about the women in this data base. Arizona Memory Project. Over 89,000 digital items related to Arizona history and culture. Arizona State Library and Archives, Phoenix, AZ. Find A Grave. Searchable on-line data base. Online biographies for Pima County. Tucson City Directory, 1912. Arizona Directory Company, Tucson Citizen Press, Tucson, AZ. Tucson City Directory, 1913. Arizona Directory Company, Los Angeles, CA. Western States Marriage Index. Searchable on-line data base. US Gen Web Archives. Pima County biographies.